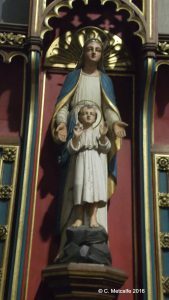 There are a number of images of Jesus as a child in St Swithun’s church as figures, statues or in a picture, rather than in stained glass. 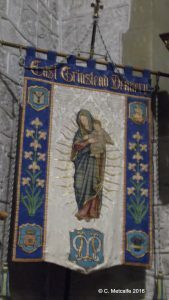 There is also a beautifully embroidered image of the Virgin and Child in the banner of the Mother’s Union. 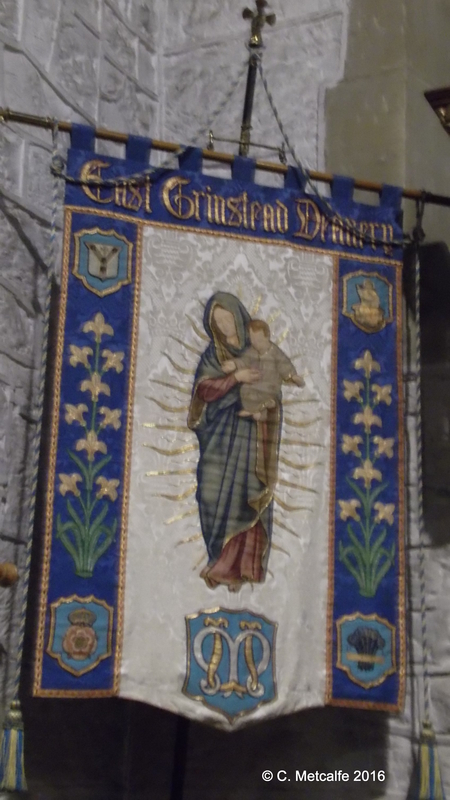 This stands, appropriately, in the Chapel of the Nativity (to the left of the main altar). 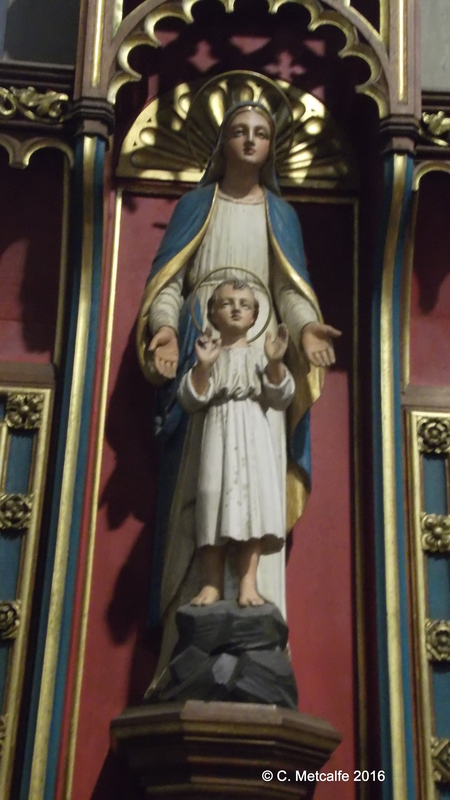 The reredos or back screen in this Chapel has the figure of Mary with a small boy in front of her. 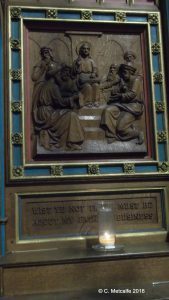 The left hand panel has a carved scene representing the time when Jesus, aged about 12, was lost by his parents. They eventually returned to the Temple and found him deep in discussion there. 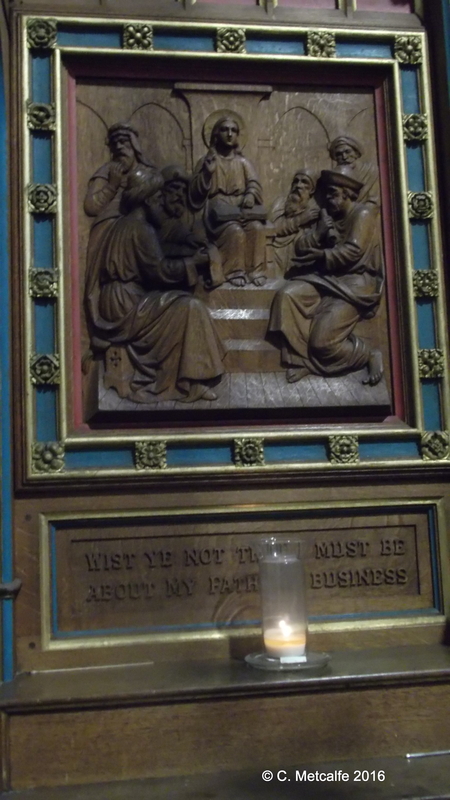 He said to his parents ‘Wist ye not (did you not know) that I must be about my Father’s business?’ These words are inscribed under the carved picture. This reredos was a gift from St Margaret’s Convent and came from the Chapel of St Michael’s School in 1938 (according to the Church Guide of 1946). When the old organ, which also came from the Convent, in 1888, was removed in the 1930s, this Chapel was created. Down the centuries people have identified with Christ as a fellow human being and with Mary as a Mother, and have created images to help their prayers. 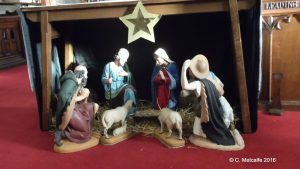 During the twentieth century, a number of pictures of the young Jesus were given to St Swithun’s, in stained glass, as carved figures or statues and created in embroidery.